A squirrel-fest of apples on the apple tree. October 18, 2015. 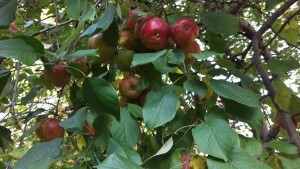 We have an apple tree in the backyard. In spring, apple blossoms and their scent fill the eyes and nose, in summer, leafy shade gives cool comfort, and in the fall—ah, in the fall—apples in abundance. More exactly, apples in abundance every other year—because this apple tree is a Haralson, a variety bred at the nearby University of Minnesota and named for the leader of the breeding effort. One year lots of flowers, the next, many fewer. 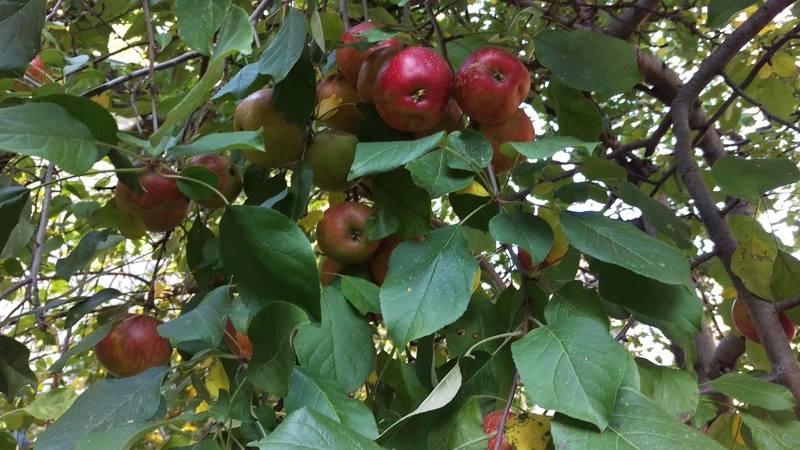 This year was a bumper crop—a couple hundred apples festooned the branches, weighing them down until some were only four or five feet from the ground. I had to duck when mowing the lawn. Where there are apple trees, there are also squirrels. Our squirrel, of the gray squirrel tribe that is very much at home in eastern forests of the country, really likes apples. He spends a lot of time in the tree, although usually before or after we are up and about. His daily practice, almost a religion it seems, is to rummage around the tree and knock apples to ground, to which he descends eventually in order to take one in his mouth, retire to a comfortable spot, and eat in leisure. Those spots are crooks in trees, horizontal branches on the pine, roof gutters, and Adirondack chairs. Once I found an apple on the wooden painting ladder we left out overnight, and another time spied one thirty feet up in the pine tree, uneaten. 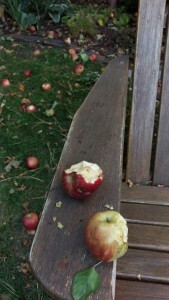 Sometimes he eats most of the apple, but usually he chews a section away and leaves it. 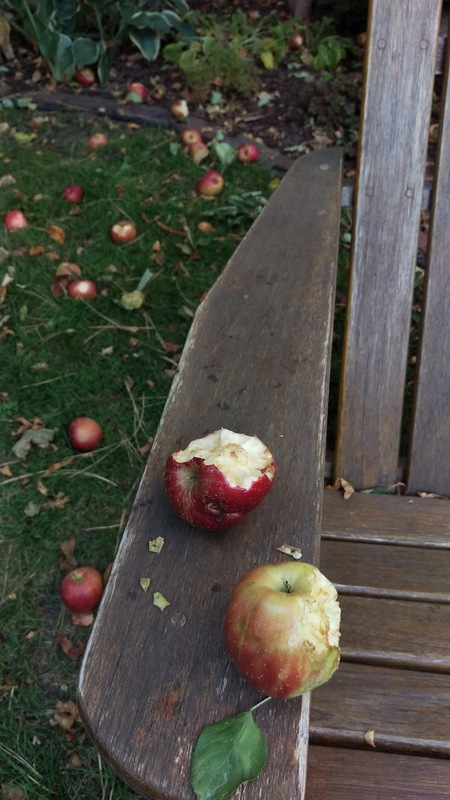 Most of the apples he knocks down have been touched in some way by this squirrel, so you might think, “Well, at least he’s using them.” But of course, he’s using them improvidently, throwing away eighty or ninety percent of most of them. 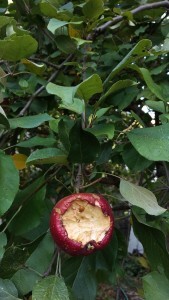 Particularly irritating to me, though, is his habit of taking a few bites out of apples on the tree and leaving them there. 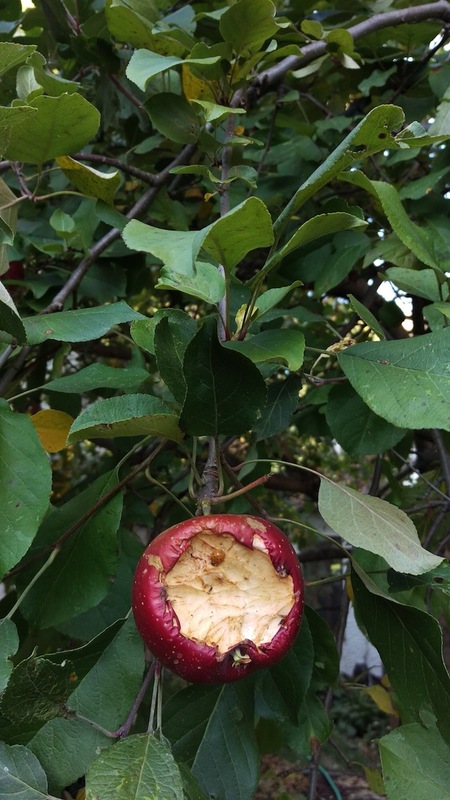 Many times I’ve reached for an especially appetizing-looking apple—ruby red, perfectly rotund, without the dimples left by apple maggot flies we have here and about—and on the backside of the apple, facing the tree—squirrel teeth marks, like a beaver’s gnawings on wood. That is the only time I curse the squirrel—when he takes, without taking, something I want. My squirrel’s behavior got me thinking about greed and abundance. (I’m not talking just about my improvident squirrel.) I suspect it is basic animal nature to take as much of a needed resource as one can get when it’s available, and the more abundant the resource, the more an animal tries to take. My mind now drifts to stories of the massive plundering of North America’s wildlife at the edge of the frontier in the second half of the 1800s—bison, passenger pigeon, deer, geese, you name it. If it existed in abundance, people took it in abundance until, of course, it was no more. They often took it wastefully…startling for me is the fact that hundreds of thousands of bison tongues were taken for discriminating East Coast palates, with the rest of the beast left. 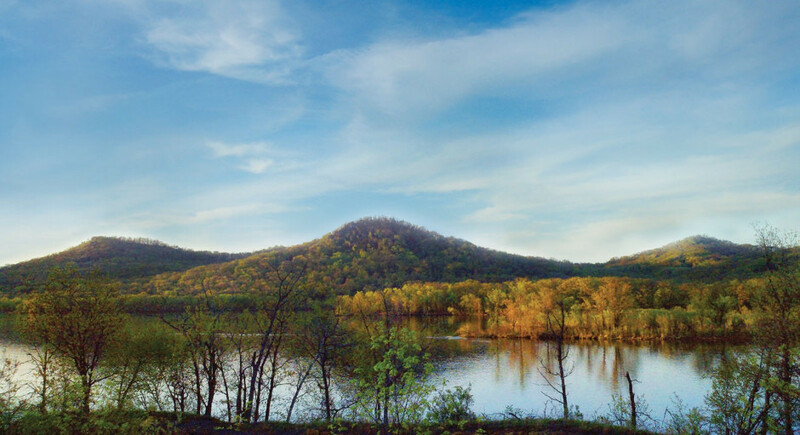 Lest we think it was people of European descent alone doing the taking, there are dozens of cliffs and narrow ravines where people have discovered piles of animal bones—the leftovers of mass killings and industrial-scale processing of wildlife by Indians. Wildlife laws in North America and Europe are protecting the four-footed wildlife today, but the finned wildlife of oceans and the planet’s large lakes are known as “open resource fisheries”—meaning, the guy with the most boats and biggest nets catches the most fish. Not surprisingly, hunted fish species are falling like dominoes, one after the other as each species is discovered, set upon with industrial scale intent, and reduced in numbers until it is not profitable to take that species—and the fisheries find another species to work on. Waste is here, too—bycatch, it is called—the thousands of individuals in a net not meant to be caught, which are dumped back in the ocean where most die from the trauma of being netted and man-handled. I suspect that, to take as much as one can get, and to take more than one needs when providence presents one with abundance, is the natural way of the world. That’s how individuals of a species get ahead, and that’s how a species gets ahead, building up its numbers on the foundation laid by successful individuals—perhaps those greediest and most successful at harvesting nature’s bounty. That is a depressing thought, perhaps, because it is so mechanistic and full of “nature red in tooth and claw” pessimism, but maybe it’s just meant to be a sobering thought. Do we not have a couple millennia of philosophical teachings that gave us such phrases as “share and share alike”, “do unto others” and “now play nice”? Yes, and laws that attempt to damp down our natural tendency toward selfish behavior, which in our millennia-long march towards freedom and security for individuals and families might now be called anti-social behavior? Is that also a natural impulse—to order our social interactions in a way that allows each individual to have enough to meet their needs, without compromising the ability of others born and unborn to meet theirs? Is not the impulse to be a shepherd, a caretaker, and a good steward also engrained in our species’ genetic blueprint? The discovery of “mirror neurons” a decade or so ago indicates a large capacity for empathy in every healthy human, which is sung out in chorus by movie-goers when good triumphs over evil or lovers finally reconcile, to name two of the most applauded and sighed-at endings. More informed people than me have discussed these two sides of human nature for centuries and have provided directional arrows that have penetrated the social fabric, producing laws that the majority agree are worth having.